11 Tips To Give Up Worry & Get On With Creating Wealth! Worry – People get soooo stuck in worrying about what will happen, what could happen, what should happen and all the while, time is ticking away from them and adding more things for them to worry about. So many things running through the brain, so many ideas that need an outlet and yet all the while, the owner of said brain is worrying about how to make ends meet, how to make anything happen, how to start their own business, how to leave their work and find financial freedom, how to live a life that fulfills them completely. Worry – the state of being anxious and troubled about actual or potential problems. So, tell me, how does Worry help, anyway? Even if the problem is happening right now, how on earth does worry help you in any way? If anything, it stops you from thinking clearly and when we talk about making money, being clear headed is absolutely essential! Worry stops you from being the powerful person you are. And it certainly holds you back from getting any kind of success because while you are worried, you are not doing the very thing that you need to do in order to create success. You are not taking action. And again, guess what? Action is also the only thing that will stop you from being constantly worried. Action is the only thing that will help you explode your income. Action is the only thing that will stop you living a life of regret. So it feels a little like a catch 22 because worry stops you dead in a lack of action and it is the action that will get you out of worry. Here’s 11 ways to combat the worry of starting a business, doing something new, growing a business, whatever? Get a Coach or a friend or someone who is completely on your side and also is not going to cut you a break. Worrying on your own is just plain hard and completely unproductive. Being with people who sympathise with you all the time is not going to help you get better or create anything. It just strokes your ego and gets you nowhere! Change the direction of your thoughts – Practice stopping your thoughts in their tracks when you feel yourself spiraling down and down into a pit of despair. Write stuff down – The act of putting things down in writing does have the tendency to help with the changing the direction of your thoughts. 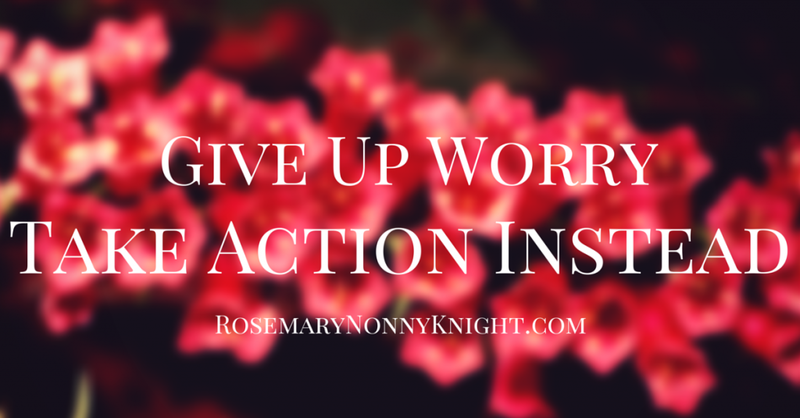 Take one action – Start doing something in the opposite direction to your worry. Your worry is taking you down a spiral of despair, action takes you upwards towards your ultimate success. Stop caring sooo much about what other people think of you – The truth is, people do not think of you as much as you might think and even if they are, worrying does not stop them. Have you heard of the wonderful game phenomenon called ‘Just Dance’? – OK, so you could play the game (Get your kids involved if you have them, they will love it and as well as getting those happy hormones, you are building the relationship) or you could just do some kind of exercise to get you out of your head and into feeling a little happier and more accomplished. Write a grateful list – What is great in your life right here and now? What could you focus on that will being a smile to your face? Stop watching sooo much TV or listening to the news – It just makes you feel like horrid things are happening all the time and that reinforces your worry. I know it make you feel like you understand what is going on in the world, but what benefit is that if all you do is worry about it? Give it up! Stop taking on the weight of the World! – Stop worrying for yourself and for everyone else in your world, from the post man to your kids. Learn to set boundaries on how much you hear about people’s troubles so you do not take on everything yourself. Get on with making some money – Take the action you need to take to start making the money rather than worrying about the lack of it. OK, You all set? Great! Go Forth and Prosper! If you are ready to start getting results from your business and you know you could do with some accountability, training and coaching then the Deliberate Millionaire is here. There are no more excuses for being stuck. Remember, it is your right, your God Given Right, to Create the life you want, and Stop living the one you don’t!